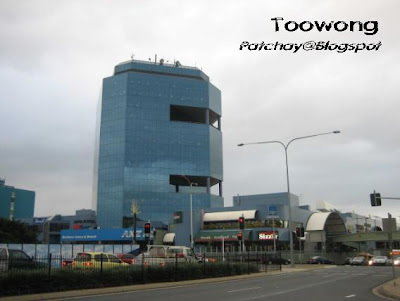 Toowong Village Shopping Mall and Railway Station, 5 minutes from my university and 15 minutes from Brisbane CBD. 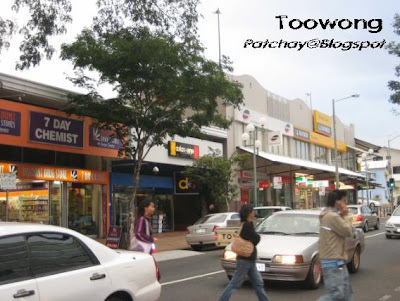 Toowong Village. 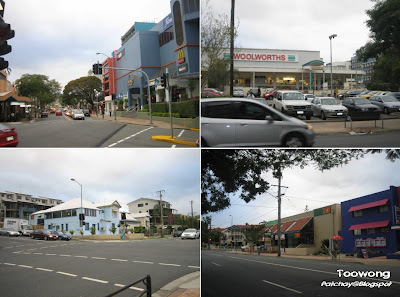 Departmental store David Jones, Kmart hypermarket and Coles supermarket. There's also a public library and a Fitness First centre. Sherwood Road. I've been walking along this street almost everyday last month! 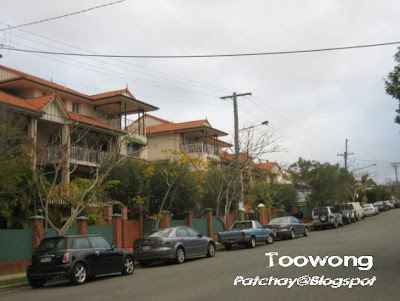 Images of Toowong suburban area. Maryvale Street. I stayed here during my inter-semester or winter break, which just ended one week ago. 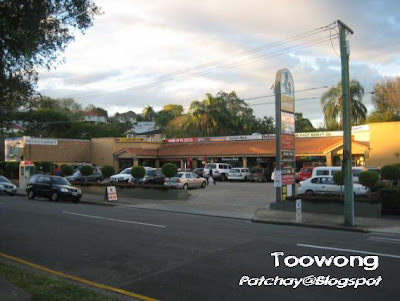 Off Milton Road... some commercial shops within Toowong residential area. 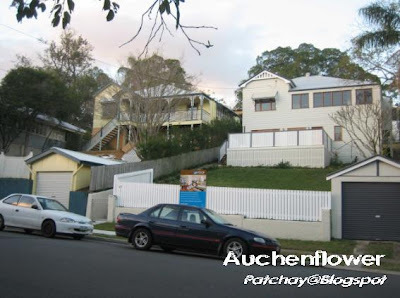 Dixon Street, off Milton Road, in a suburb bordering Toowong called Auchenflower. 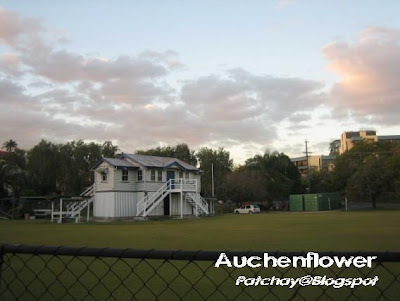 Auchenflower Sports Centre, uniquely isolated, sitting in the middle of greens! 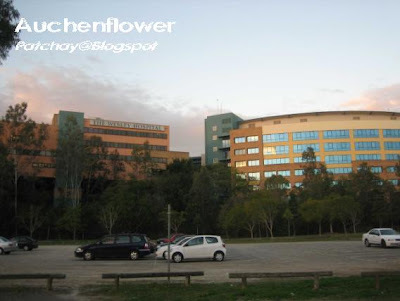 The Wesley Hospital at Auchenflower. 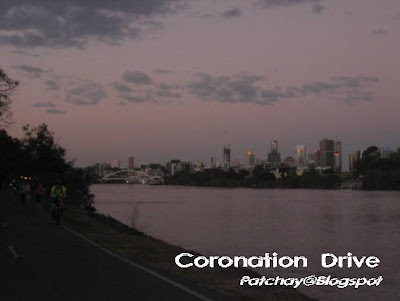 Sunsetting view from Coronation Drive promenade, looking towards Brisbane City. 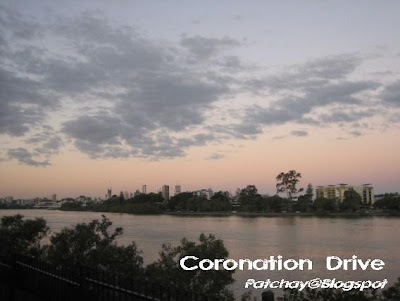 Coronation Drive promenade. Regatta CityCat ferry pier. Looking towards West End suburb. Brisbane River. Honestly, mother and 2 children rowing boats. Evening time. Time for Me to go home... lol. 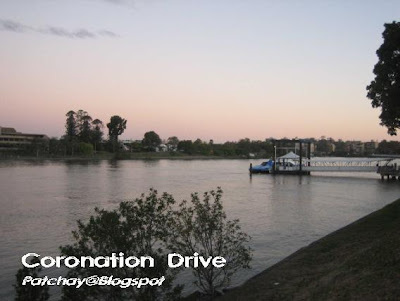 Coronation Drive and riverside. Evening jog, walk, run or cycle. 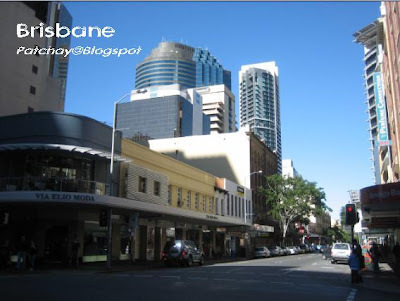 This is typical "laid-back" Aussie or Brisbane lifestyle. 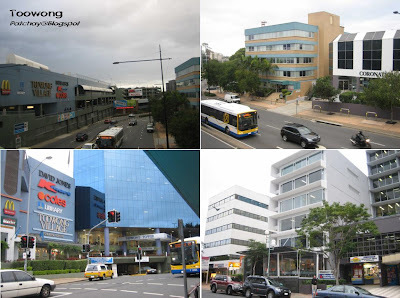 The Regatta pub and entertainment, 10 minutes walk from Toowong Village, is the most happening place on Coronation Drive in the evening. 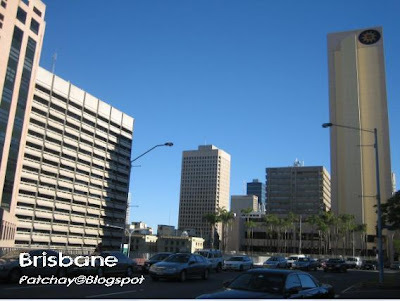 Tags: Australia, Queensland and Brisbane. Shopping spree! 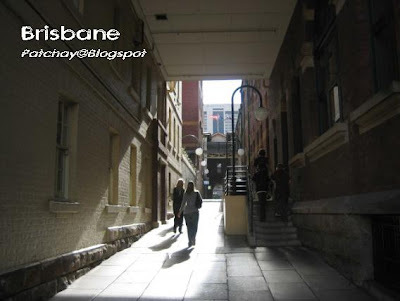 Near Queen Street Mall. 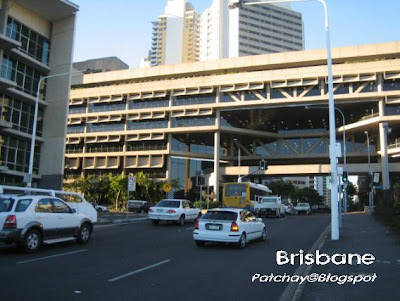 Typical Brisbane on the road. Forgotten exactly where is this... somewhere in the heart of city. Post Office Square, along Adelaide Street. Post Office Square. Like you're walking through the narrow backyard in Europe. 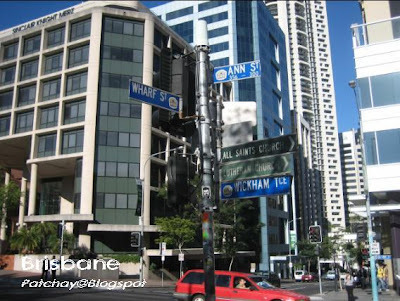 Opposite Post Office Square is Anzac Square. 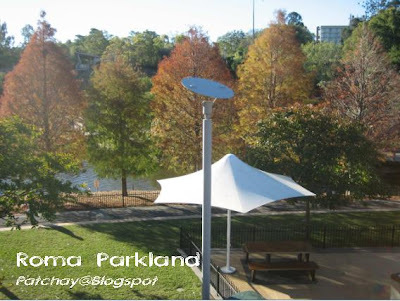 Take the escalator down, and you'll see a nice foodcourt under this park. $4.50 for my simple Chinese lunch here that day, cheaper after peak time, that means after 2pm lol. Cathedral of St. Stephen, not St John's (in previous post) ya! A Catholic cathedral built with its famous "living stones". Comparing both, can you identify their differences? 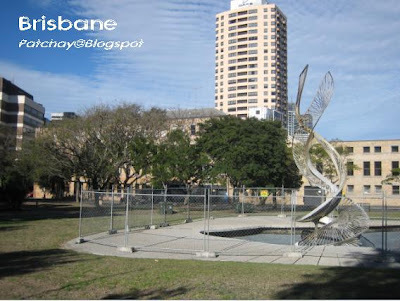 This is where Jason Goh (aka smashpOp) jumped when he visited Brisbane some time ago. Old government buildings. 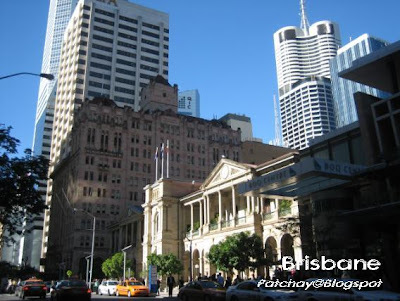 Margaret Street (left) and Brisbane City Hall & Museum in King George Square (right). 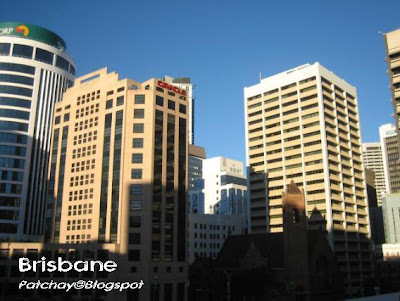 Brisbane's Financial District. 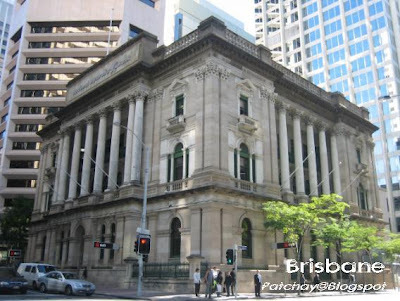 I think this colonial building is Queensland headquarters of National Australia Bank (NAB). On the left is HSBC. Financial District. Most bank offices are adjacent to each other. 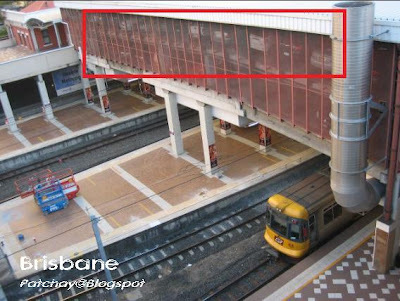 I think this is Brisbane Translink Transport Office... vehicles can pass through underneath! I'm totally confused, which way should I go now? Turbot Street view of Central Station outer wing. 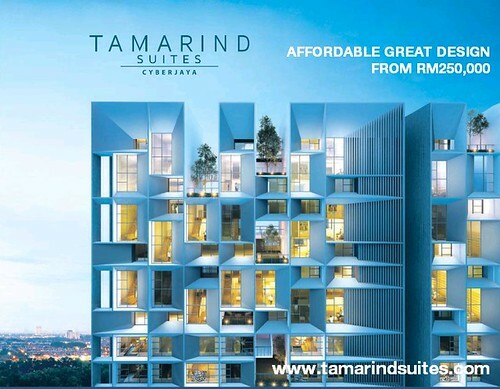 Red box: You see how the cars packed like sardines! Upper Roma Street area. 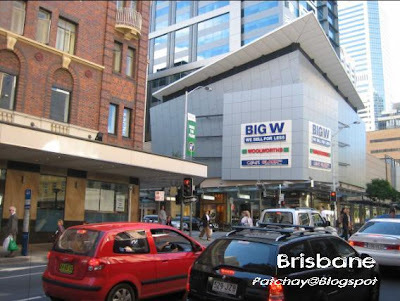 Near to Brisbane's backpackers hub and Transit Centre. 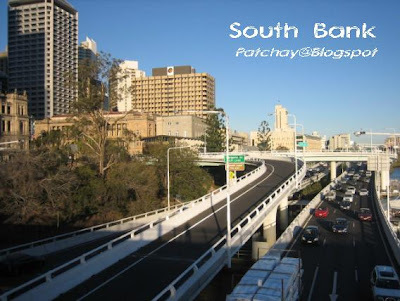 The continuation of Riverside Expressway (remember the elevated road in North Quay?) 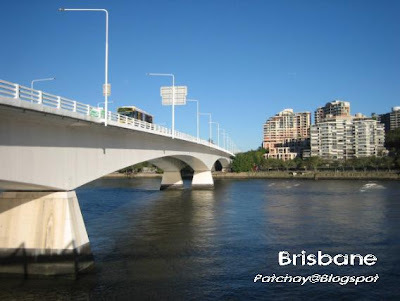 crossing Brisbane River to Woolloongabba. The Goodwill Pedestrian Bridge, from Brisbane Riverstage (where I worked last few weeks) to Maritime Museum at one end of South Bank. 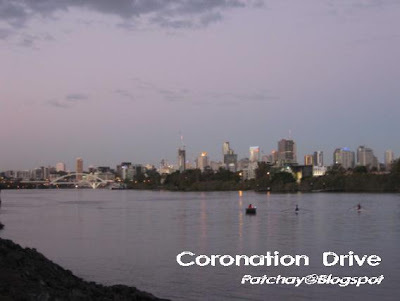 Imagine you can sit down, relax, over Brisbane River while enjoying the breathtaking city view. Cold wind blew onto my face, and whirled around me, and I felt soo damm COLD. Watch out for Part 11 as Patchay embarks on his most "Shivery", yet Unique tour. 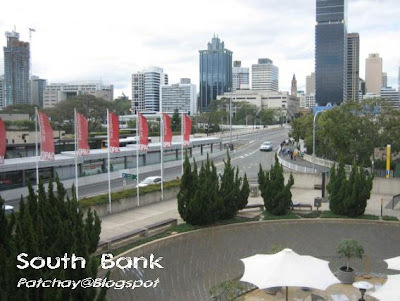 Welcome to South Bank, the place that hosted the World Expo in 1988. 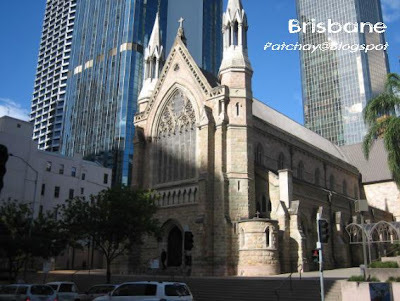 It is also Brisbane's most visited tourist venue. For every photo below I'll elaborate briefly as my time is very precious now haha. 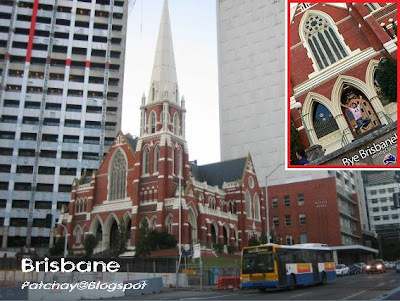 Queensland State Library (left picture) and Queensland Performing Arts Centre (right). (left) Queensland Art Gallery corridor and (right) ground outside Queensland Conservatorium at Griffith University. Queensland Performing Arts Centre and North Quay skyline. 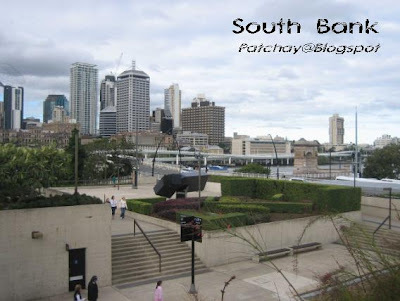 South Bank and Brisbane City. Traffic jam in one direction only. Went to the city and now crossing Victoria Bridge back to South Bank. 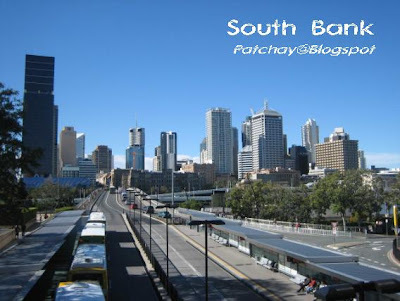 South Bank's Cultural Centre Busway Station. 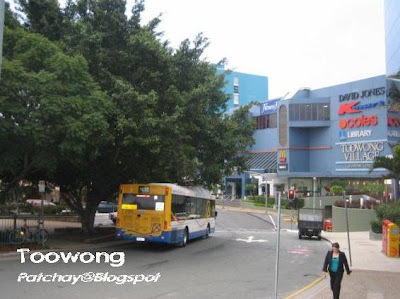 Once took a bus from here to my workplace at East Brisbane suburb, next to the more-famous Wollonggabba suburb in Zone 1. Whole afternoon chillin' at South Bank. 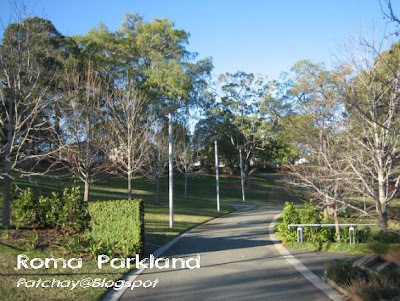 One parkland after another. Quite boring. Unlucky Me. 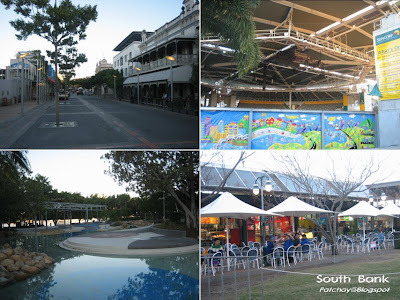 South Bank's most popular attraction - an artificial white sand beach was closed for maintenance when I was there. 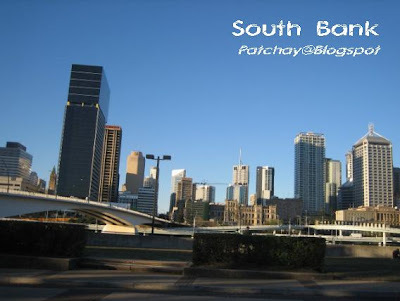 South Bank's entertainment and shopping street! 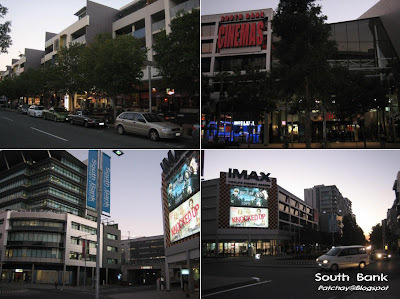 Recently, I watched Transformers and Harry Potter here. 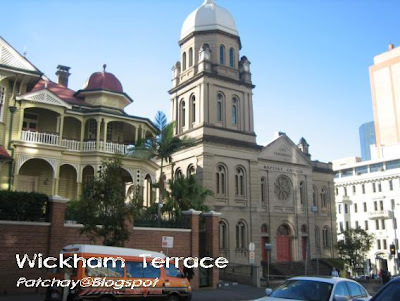 Wickham Terrace and Wickham Park area. Lighthouse? 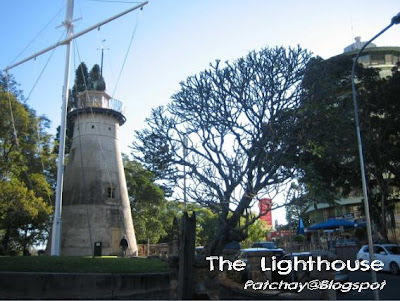 Actually this has never been a lighthouse (watermark mistake^^), but a Windmill constructed by convict labour in 1828. It is now used as a weather observatory. 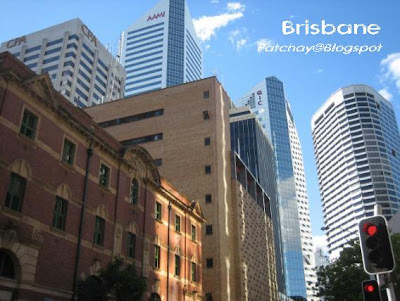 And it is the oldest surviving building in the entire state of Queensland - prehistoric! 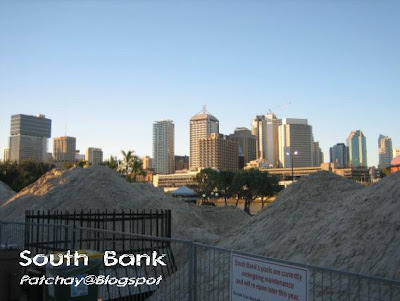 The view of Brisbane City from Wickham Park. Next to this place is a bigger park haha ! 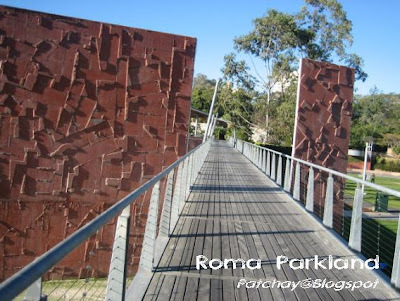 I arrived in Roma Street Parkland! Winter afternoon. 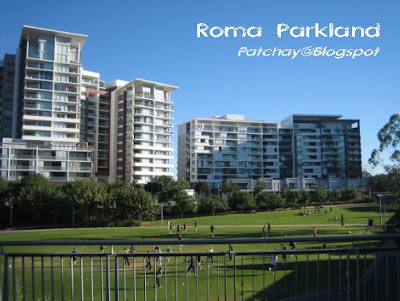 People playing soccer at Celebration Lawn, Roma Street Parkland. The Hub and the Allee Bridge. There's even a canopy walkbridge on the other side. The Frangipani Court. Relax. Peace of mind. This is the canopy bridge I said earlier. 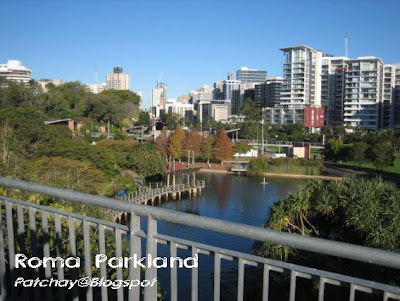 Overlooking Brisbane City and Roma lakes. Now I'm entering the forest... canopy walk, height not very high though. Looks like a Japanese garden. Very very nice! 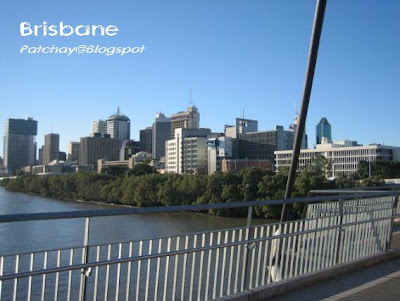 Now I know why Brisbane was voted the 6th most liveable city in the world in a survey in 2004 (ranked equally with Adelaide, Sydney, Copenhagen, Oslo and Zurich, of which Melbourne topped the list and London was 45th). 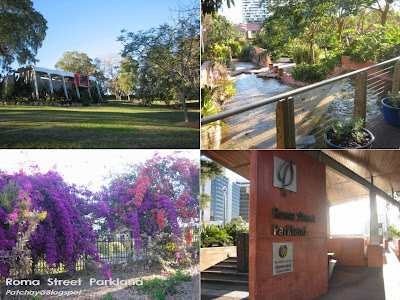 (clockwise) Harry Oakman Pavilion and Upper Parkland; The Spectacle Garden and miniature waterfall; The Flower Garden at Foxtail Avenue; and Roma Street Parkland entrance. 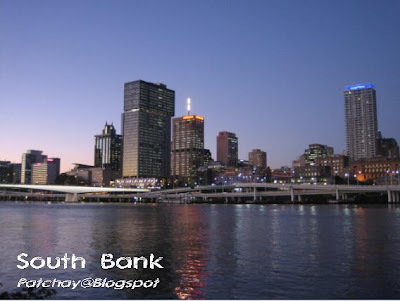 Coming up next: Part 8 - South Bank, most visited tourist attraction in Brisbane City.